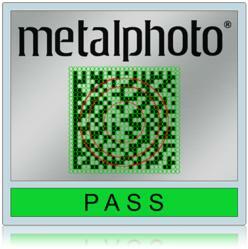 Metalphoto earned the highest score possible on 9 of the 10 tests conducted, more than any other material evaluated. The Naval Surface Warfare Center (NSWC), Corona Division announced the results of a year-long evaluation of label materials marked with Item Unique Identification (IUID). Item Unique Identification policy requires all military assets specified under MIL-STD-130 to be marked with a unique, two-dimensional barcode that will survive the normal life expectancy of the item to which it is affixed. The study was commissioned to help item managers navigate the large variety of commercially available label materials and provide an unbiased, Government sponsored comparison of durability. A total of eight companies submitted 26 label materials, including printed polyester, laser markable acrylic, Metalphoto® silver impregnated photosensitive anodized aluminum and ceramic coated stainless steel. The labels were subjected to ten laboratory tests designed to simulate desert, marine and submarine operating environments, including resistance to debris/chipping, abrasion, chemicals, temperature ranges and salt fog. Metalphoto was the only material to pass every test (with the exception of MIBK solvent immersion test, which all materials failed). Further, Metalphoto earned the highest score possible on 9 of the 10 tests conducted, more than any other material evaluated. The Navy study confirms that Metalphoto performs well in a wide variety of conditions including abrasion, debris, heat, salt fog and chemical exposure. The study did not test for ultraviolet (UV) resistance despite the fact that fading due to sunlight exposure is a common cause of label failure. The Metalphoto image is UV-stable and has an estimated outdoor life of 20+ years. The product’s performance specifications are summarized here. Generically referred to as “Type 1 photosensitive anodized aluminum” or “silver impregnated photosensitive anodized aluminum,” Metalphoto creates a permanent image that is sealed inside the anodized layer, making the image virtually impervious to chemicals, heat, abrasion, salt spray and sunlight. Because of its ability to perform across a range of challenging environments, Metalphoto meets an array of government, industrial and military specifications. The material has been used for durable labels, nameplates, control panels and service diagrams/schematics since 1958. For specific details about the Corona IUID Center’s tests; review the complete report here. This press release was issued by Horizons Imaging Systems Group, the manufacturer of Metalphoto. For more information about Metalphoto please visit http://www.metalphoto.com. Since its discovery in 1958 by Horizons Imaging Systems Group (ISG), Metalphoto has been the "go-to" option for durable labels, nameplates, control panels, service diagrams and more. Metalphoto meets an array of commercial, government and military specifications including MIL-STD-130N for Department of Defense UID bar code applications. Finished Metalphoto parts may be purchased from hundreds of independent converters located around the world. Alternatively, Metalphoto can be produced on site, where and when needed. Contact Horizons ISG for a list of recommended converters or to set up your Metalphoto system. Metalphoto is a registered trademark of Horizons Inc.